There is also a useful link on the desktop of the PC in the teaching room called AV User Guide. This will take you directly to our online user guides. The TEL & AV Team have completed the AV upgrade of teaching rooms on the Ground Floor of Palmer. See our AV Upgrades page for the latest schedule. Here is Jess (second from right) with some of our other happy customers! 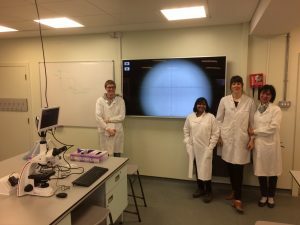 The AV Team will be demonstrating one of our new interactive monitors that are being installed as part of the upgrade of teaching spaces. 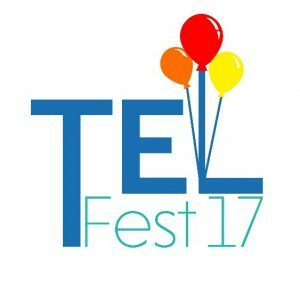 Come and have a look on the Information Technology stand at the TEL Roadshow on Tuesday, 11 July – 13:00-14:00, part of the TEL Fest being organised by the TEL Team in CQSD. Firstly, we apologise for presenting you with another survey. However the TEL & AV Team are committed to improving teaching facilities and it is important that we get your feedback. Please take a few minutes to complete our survey. It is available here and will be open until 28th July, 2017. New AV upgrades carried out by the team provide high quality, energy efficient audio and video. This can be experienced in 14 new teaching rooms in Chancellor’s Building. The team have obtained approval and funding from the University to carry out a number of AV upgrades for the current financial year. See here for the schedule of works: AV Upgrades. We are also seeking approval to continue this work over at least the next 2 years. Many of the issues highlighted in last year’s survey will be resolved as the upgrade work continues. Our new lecterns have interactive monitors, in-built cables, document cameras, and more space for laptops as standard. We are working with departments to ensure AV equipment meets requirements and have been able to carry out a number of installations in-house. We are continuing to investigate new technologies such as ‘BYOD’.